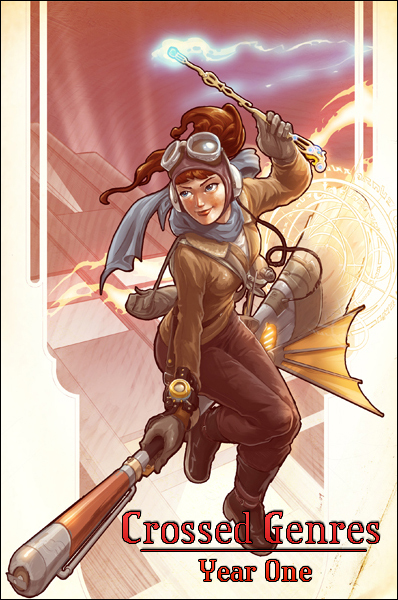 Sunday is the final day to submit to the Steampunk Issue! Get your stories and artwork in! This is your LAST CHANCE to enjoy Issue 3: ROMANCE! After Sunday it goes away forever! Please read it, and consider buying a copy (only $5!). February 1 is also the release day for Issue 15: Any Previous Genre. This issue has come together brilliantly, with wonderfully diverse stories, a great article about Fanwriting as Folklore, and an incredible cover by Nicc Balce, who also did the above art for the anthology. Can’t wait for you all to see! If you’re in the Seattle area, consider going to a Crossed Genres Issue One release party! Three of the writers whose stories appear in the anthology will be there! At the Snoose Junction Pizzeria/Greenwood Upstairs Bar. Here is a review of Crossed Genres Year One! A good one, too! We hope to see several more in the near future. Also, don’t forget that next month we’ll be taking submissions for our ANTIHERO issue! We want your roughest, gruffest, most dastardly protagonist! Post title from the poem “High Flight” by John Gillespie Magee Jr.